Well, it's about time I came clean. I have a hidden addiction! COSTCO! I love Costco. I like to go to Costco when I don't even need anything from Costco. I love to walk the isles and see what's new. I love seeing food in big packages and thinking about all the wonderful things I'm going to make with that food. And every now and then you discover new, unique and interesting products at Costco. 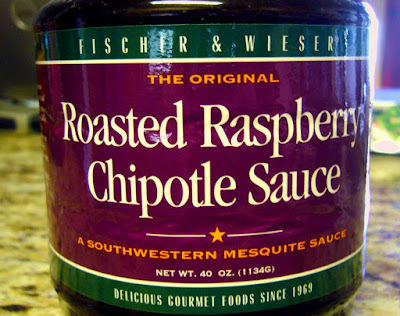 A few years ago I made this delicious find; Raspberry Chipotle Sauce. I know it sounds crazy, but it's amazingly yummy. We use it as a replacement for BBQ sauce on chicken or steak for all our summer grilling. But recently I wanted to figure out another way to enjoy this condiment on days when it's too cold to break out the grill. 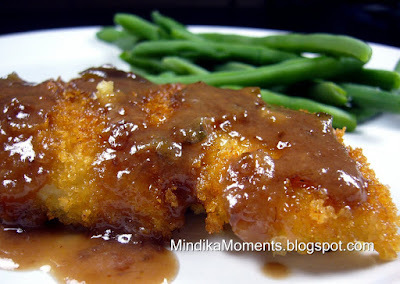 I came up with this yummy cream sauce drizzled over Panko Chicken. It was an instant hit, and really easy. I also think the sauce would work on hamburgers, turkey or chicken sandwiches, or as a dipping sauce for chicken strips or nuggets. 1. In a medium size sauce pan, combine the Raspberry Chipotle sauce, half & half, stock and butter. 3. Meanwhile, heat 2 T. of olive oil over medium/high heat in a large skillet. 4. Take the pounded chicken and season it with spike seasoning. 5. Combined the Panko bread crumbs with salt & pepper to taste. 6. Dredge the chicken in the beaten eggs, then the Panko bread crumbs. Shake to remove excess. 7. Saute the chicken in the hot olive oil for 4-5 minutes per side, or until the chicken is golden brown and done in the center. 8. Serve the chicken drizzled with the raspberry chipotle sauce. I am a random visitor to your blog, but I saw a post about the raspberry chipoltle sauce from Costco and thought I had to tell you about another idea on what to use the sauce for. If you ever need to take a cheese and crackers plate to an event this sauce will save your day. Just get a package of cream cheese and place it on a plate. Poke a couple holes on the top of the cream cheese with your fingers and pour the sauce all over the cream cheese. Serve with crackers. It is really yummy and practically effortless. Thanks for the tip, that really sounds delicious! With the holidays coming and several parties and/or get-together's, I'm sure I'll give it a try. When Andrew and I first were married, the sauce over cream cheese mentioned above was the absolute favorite of all the ladies in my ward. And since it was a seasonal item, they would all stock up to have enough for the rest of the year. Can't wait to try your recipe!